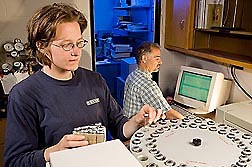 University of Minnesota technician Sonya Ewert (left) and ARS soil scientist Rodney Venterea use a gas chromatograph to determine amounts of greenhouse gases in samples collected from fields. Nitrous oxide can contribute significantly to atmospheric warming because, pound for pound, this greenhouse gas absorbs 300 times more radiation than carbon dioxide. It is also the most important stratospheric-ozone-depleting chemical emitted by human activities. Therefore, scientists are trying to identify strategies to reduce nitrous oxide emissions from agricultural soil. Many of these efforts have focused on the role of nitrate, a form of nitrogen produced by soil microbes following the application of nitrogen fertilizers, because soil organisms can convert nitrate to nitrous oxide. However, Agricultural Research Service soil scientist Rodney Venterea suspected that nitrous oxide emissions are even more strongly correlated with levels of nitrite—a form of nitrogen that is not commonly measured. Venterea conducted a study in maize over two growing seasons, examining the effects of different nitrogen fertilizer sources and application methods on nitrous oxide emissions. The fertilizers were conventional urea, polymer-coated urea, urea infused with microbial inhibitors, and a 50/50 mixture of conventional urea and urea-with-inhibitors. Each fertilizer was applied to experimental fields using either uniform broadcasting or concentrated banding. Venterea’s results indicated that nitrous oxide emissions were strongly linked to soil nitrite levels, which accounted for 44 to 73 percent of the variation in nitrous oxide emissions. Neither soil nitrate nor ammonium levels had similar correlations with nitrous oxide. 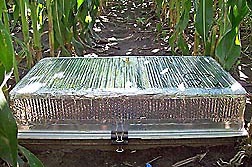 A covered gas flux chamber from a study done in a field of maize during two growing seasons. The study examined the effects of different nitrogen fertilizer sources and application methods on nitrous oxide emissions. “The most important finding here is that practices which reduce nitrite have good potential to also reduce nitrous oxide,” Venterea states. The results also showed that the lowest levels of nitrite and nitrous oxide occurred with the fertilizer that contained urea infused with microbial inhibitors. The 50/50 mixture also reduced both nitrite and nitrous oxide. Using this 50/50 combination might be more cost-effective for reducing nitrous oxide because it could cut the cost of just using the more expensive urea infused with microbial inhibitors. Venterea, who works in the ARS Soil and Water Management Research Unit in St. Paul, Minnesota, published his results in 2013 in Soil Biology and Biochemistry. This work was conducted as part of GRACEnet (Greenhouse-Gas Reduction through Agricultural Carbon Enhancement Network), a national network of ARS research projects investigating the effects of management practices on soil carbon sequestration, trace gas emissions, and environmental quality. Venterea concludes, “More consideration needs to be given to nitrite. We still do not fully understand the factors that control nitrite dynamics in soil.”—By Ann Perry, Agricultural Research Service Information Staff. Rodney Venterea is with the USDA-ARS Soil and Water Management Research Unit, 1991 Upper Buford Circle, St. Paul, MN 55108; (612) 624-7842. "Nitrite’s Significant Role in Nitrous Oxide Emissions from Soil" was published in the April 2014 issue of Agricultural Research magazine.